1. Remember than many foods are poisonous to our pets. When cooking for a family get together, stress the importance to your guests to not feed your pet table food – no matter how cute they are or how much they beg! Common foods such as onions, grapes, raisins, chocolate and even some sugarless items (xylitol) are toxic to our pets. 2. As spring and summer approach and warm up the temperature, never leave your pet in a car unattended. On a 78 degree day, all cars can become deadly within 15 minutes – even with the windows open. 3. Put together a pet first aid kit and keep one in your house and one in the car with you when you travel. Some common items to keep in your kit should include: sterile gauze and bandages; triple antibiotic ointment; hydrogen peroxide, (in pre-measured doses of 1tbsp for every 15lbs in a dropper bottle), in case you need to induce vomiting; scissors; tweezers; and an emergency muzzle. 4. An injured pet that is in pain, or going to be moved while in pain, can and will bite; for your safety muzzle the pet before moving or treating it – but be sure never to muzzle any pet who it vomiting or having breathing problems. 5. If your pet is having a seizure, never place anything in their mouths, and reduce external stimuli like shutting off the lights, radio and TV. 6. Keep your pet up to date on their checkups and vaccinations. Cats should have a checkup once a year and senior pets every 6 months. 7. Take a pet first aid and CPR class by a certified Pet Tech. This can be life saving for your pet and teach you how to address a simple wound that could happen out on a walk with your pet. 8. Know the numbers of the nearest Animal Emergency Hospitals in your area along with pet poison control numbers. Have them programmed into your cell phone and place them on your frig. 9. Stay Calm. Your pets will pick up on your excited state. 10. Don’t let your pets drink out of streams or any water that you wouldn’t drink out of. Always carry fresh bottled water for them wherever you are taking them. For more information on the next Pet CPR & First Aid Class offered on Long Island click here. 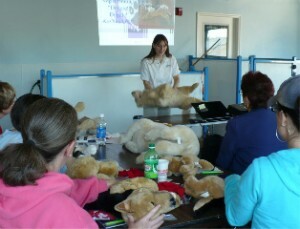 Robyn Elman, President, In Home Pet Services, Inc. teaching a recent Pet CPR & First Aid class.